I’m not talking about computer memory. I have a fair size collection of 1/4″ drive bits. Flat and phillips screwdrivers. Many sizes of Torx. Star drives, nut drives. But any way you cut it, sifting through them loose in a box was a mess. It reached a critical point when I knocked the box off my tool chest and they scattered all over the garage floor. Colorful vocabulary and lots of searching on hands and knees ensued. A quick FreeCAD design and some 3D printing later, and they’re all organized. 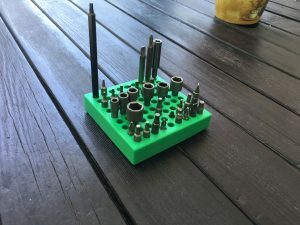 Files are available on Thingiverse.